I made these for a meeting this week and they went over very well. In fairness, I suspect that anything with chocolate would probably go over well at any meeting that starts at seven on a busy Tuesday evening, but I still think it's a good recipe. As usual, I'm only getting around to actually updating this blog because someone(s) asked for the recipe. I like to think that I'm not so much "lazy" as "insanely busy." But that may be denial; it's probably a little of column A, a little of column B. 1/2 C brown sugar (white sugar would work, I just happened to be out of it). You really want the butter and sugar to be well mixed. I wait for it to look light and almost fluffy. 1 egg/1 egg replacer equivalent (I used the replacer). 1/2 tsp vanilla extract (use the real stuff, vanillin fake stuff is vile). In a separate bowl mix: (candor compels me to admit that I don't bother with the "separate bowl" thing, but that's because I have a stand mixer so everything gets mixed fast. If you're mixing by hand you really should mix dry ingredients separately). 2. 1/4 C dark chocolate (an extra half of a 85% dark lindt chocolate bar I had sitting around). 3. 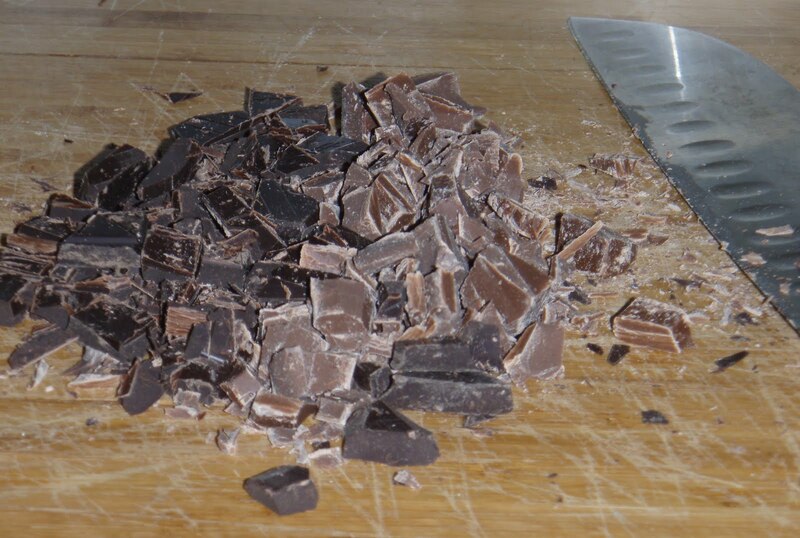 1/4-1/2 dark chocolate truffles, chopped. A kind friend gave me a ton of these when I was sick last year, and I haven't been able to get through all of them, so I threw them in-- definitely a good move. For those (like one of my siblings) who are allergic to milk, it would totally work with all dark chocolate. The chopped truffles are a nice addition, though, so if you happen to have dairy-free truffles on hand (don't laugh, many people in my family would have random truffles lying around) do chop a few and throw them in. 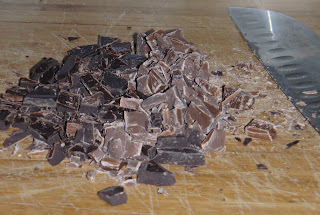 Mix in the chocolate pieces (this can be done with a stand mixer turned to low or just with a spatula). At this point I rolled the cookie dough into balls (1-2" in diameter), stuck them on a cookie sheet and froze them. This is the best way to plan ahead for cookies when you know you won't have much time during the week. If you want cookies right away, obviously don't freeze the cookie dough. Bake at ~350F* for 8-10 minutes (may take a couple minutes longer if dough is frozen). You want these cookies to look just barely undercooked when you take them out of the oven. Directly after taking out of the oven sift powdered sugar on top of them. The first layer may melt a bit, that's ok. Just keep adding sugar until they look thoroughly dusted. Let cool on the pan for about ten minutes, then loosen with a spatula. Add more powdered sugar if necessary. Note: it's not a great idea to package the cookies into a tupperware container before they are totally cool, or they'll kind of melt together. Nobody will be terribly bothered by this, but it is a bit of a pain. *sorry about the iffy temperature. I live in a craptacular student apartment whose oven takes a somewhat stochastic approach to temperature regulation, so I have to guess what temperature it really is at any given moment. Okay, I have to try these, and thank you! They really are very good, if I do say so myself. The people at the meeting snaffled up the lot of them. And I was careful to make them mom friendly for you, especially since you were the one who bought me the raspberry extract when I was home for Christmas! 1. If you use egg replacer you could probably replace the water for ~ 1/4 C raspberry jam. I think that'd give you the right liquid/flour balance. but with raspberry jam/chocolate cookies instead of butterscotch/peanut butter. It won't be the same, but it will still be a tasty raspberry chocolate cookie!